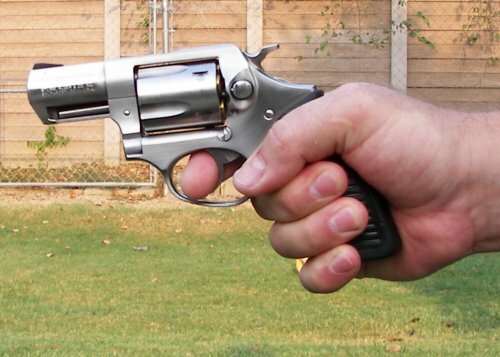 There are scores of articles written on the correct way to grip a handgun, both semi-auto pistols and revolvers. For the purposes of simplicity, I have illustrated with a few photos, three ways of gripping a gun that is part of a total package. It will enable you to hit your target, which is, well……the reason you pick the gun up in the first place. There is some good basic instruction below. But as you practice, you'll likely work out slight variances in your grip, that will suit your own physical ability and preferences. In a two handed grip which is going to be your best bet in any situation, the first step is to place the gun correctly in your strong hand. For a semi auto pistol, the gun back strap should rest as high in the crook between your thumb and first finger as possible. This placement in the strong hand stays the same regardless of which type of grip you take from here. 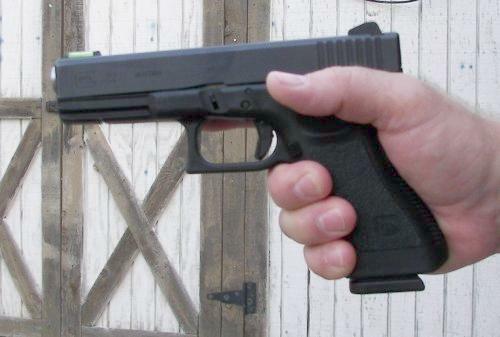 The first and best type of handgun grip for a new gun owner and shooter is to grip the gun with the strong hand thumb wrapped around and touching the middle finger on the grip. If you carry a handgun concealed or openly for self defense, get the best firearms legal protection in the U.S. The support hand is wrapped around the strong hand with the thumb lapped over the strong hand thumb. When firing the gun the strong arm should be stiff, with the support hand pulling back slightly against the shooting hand. 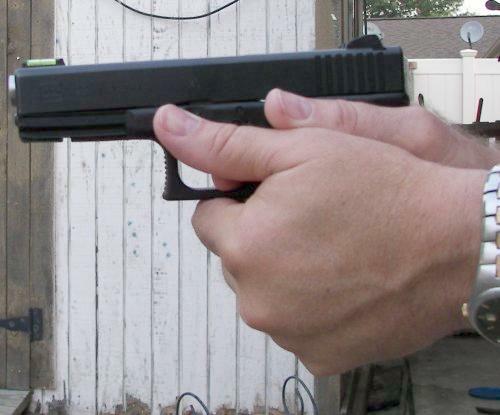 This push-pull action steadies the hands and wrists and gives a strong aiming platform for firing the handgun. This is an extremely strong style of grip and for non-competitive shooters it is a grip that will serve you well for life. 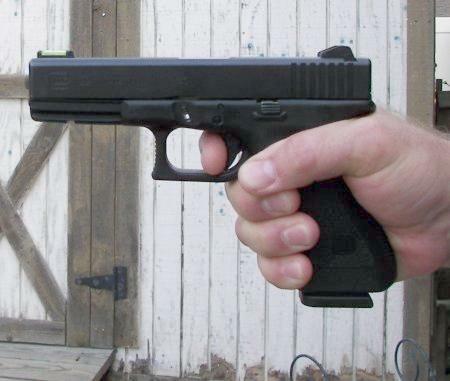 The next type of handgun grip is typical of serious competitive shooters. It starts with the support hand thumb resting parallel with and just under the pistol slide (first picture at top of page). The support hand is wrapped around the strong hand with the thumb lined up in front of the shooting hand thumb and pointing forward. This affords maximum control of the gun when moving from one target to another and enhances accuracy. The forward point of both thumbs seems to assist in quickly lining up the sights on multiple targets. This handgun grip is harder to master than the first, but if you intend to compete or do any type of serious tactical shooting, it is worth the time it takes to work it out. Also, among top shooters, this grip varies considerably. 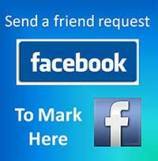 The real consistency is in the wrap of the strong hand and pointing of the thumbs forward. To master this, you'll want to make sure the placement of your hand and thumbs provides maximum enhancement for quick target acquisition. The video below shows, in detail, how to strengthen your grip for maximum control of your handgun. A grip that will allow you to get on target, and stay on target for the fastest, most accurate shooting of multiple shots in any defensive situation. This is where to consider how fast you can place shots in a potentially life threatening situation. It also shows you some fairly serious errors people develop in their grip on their handgun. Last, and sometimes necessary, whether in competition or in real life situations, is a one handed grip which is simply the first grip described without the support hand. 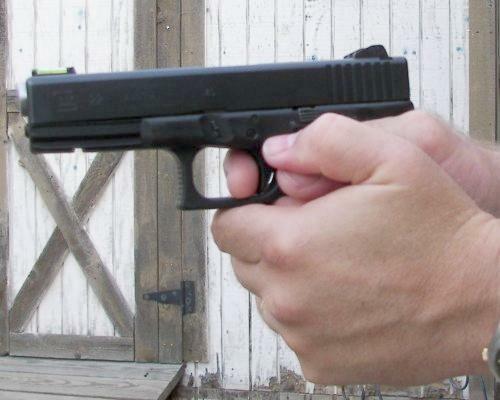 The back strap of the handgun is placed as high as possible in the strong hand. 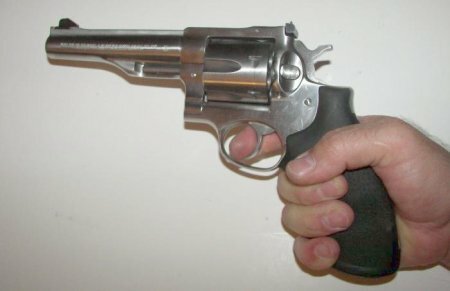 The hand is wrapped around the gun with the thumb touching on top of the middle finger on the grip. A firm grip and straight wrist is necessary to be effective. This grip is illustrated in the second picture on the page. This becomes increasingly prevalent the larger the revolver you shoot. 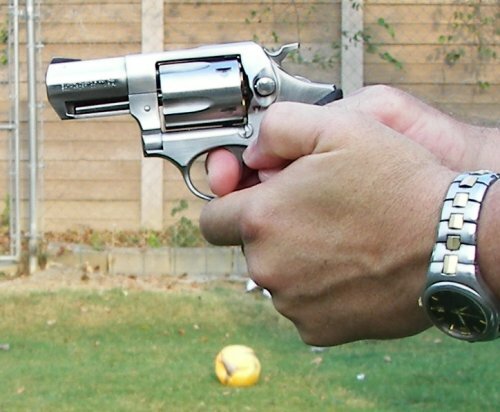 For a correct two hand grip on a revolver, a strong lapping thumbs grip is always appropriate. Trigger control belongs on the same page with gripping instructions. For a new gun owner and shooter, the tendency is to jerk the trigger. This is a natural tendency that has to be mentally intentionally corrected before a shooter will be able to effectively hit any target. All triggers on all guns must be sss….qqq….uuueeee…..zzz…eeddd. That’s “squeezed” steadily and not jerked. If you do everything else right and do not exercise proper trigger control, you will not hit your target. End of story. Sell the gun. 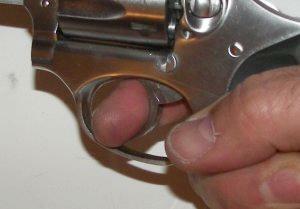 Below left is correct finger position on a semi auto - on the right a revolver. Seriously, for all types of grips, you must mindfully make yourself press the trigger smoothly and slowly for your shooting to be accurate. 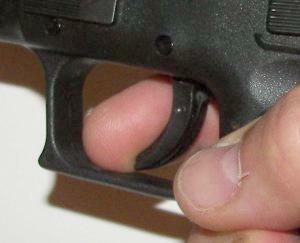 This requires your grip to be correct and the first pad of your index finger placed firmly on the trigger. Get this right, and you will likely be an adequate to great shot according to how much you practice.